Attach to a hero. Attached hero gains +2 Willpower. If attached hero is Aragorn, he also gains a Spirit resource icon. Attach to a hero. 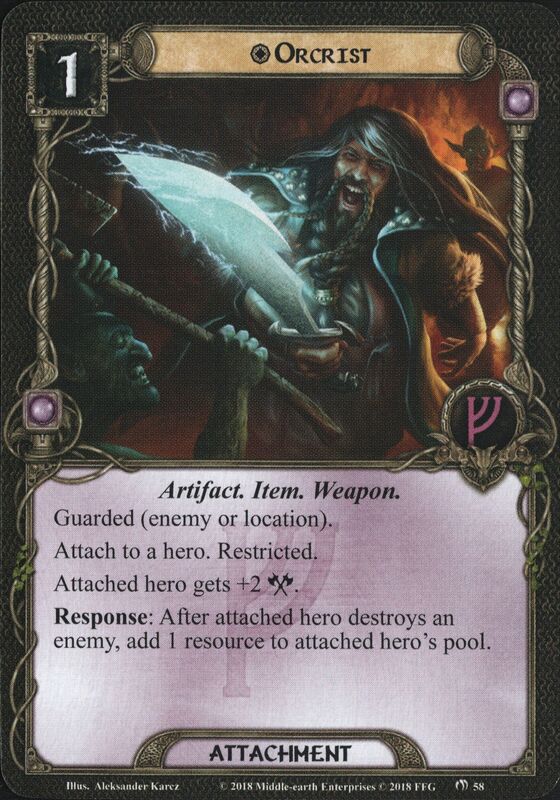 Response: After a character is destroyed, add 1 resource to attached hero's pool. Attach to Galadriel. She gains a Lore resource icon. Quest Action: Exhaust Nenya and Galadriel to add her Willpower to another character's Willpower until the end of the phase. 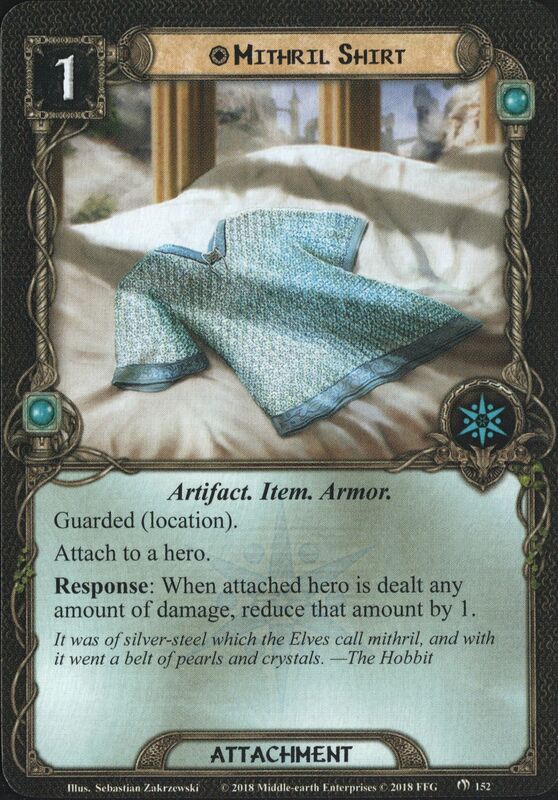 Attach to Elrond. He gains a Spirit resource icon. 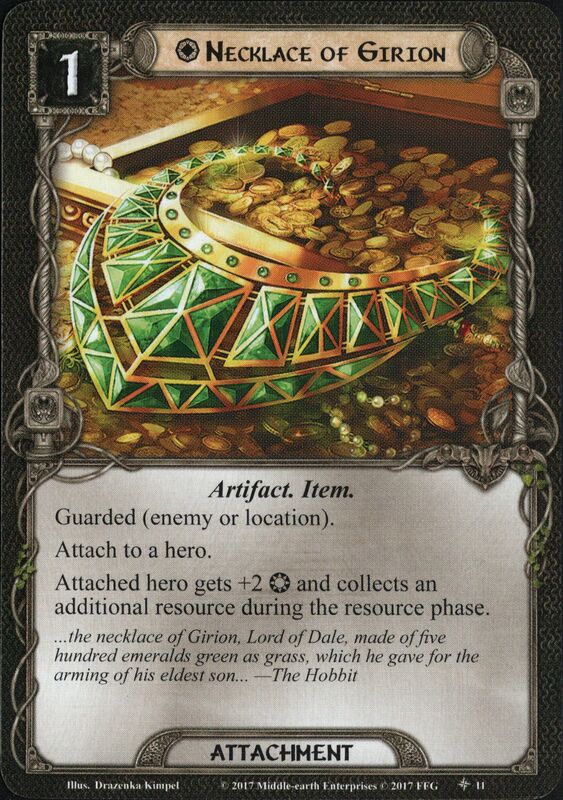 Action: Exhaust Elrond and Vilya to reveal the top card of your deck. 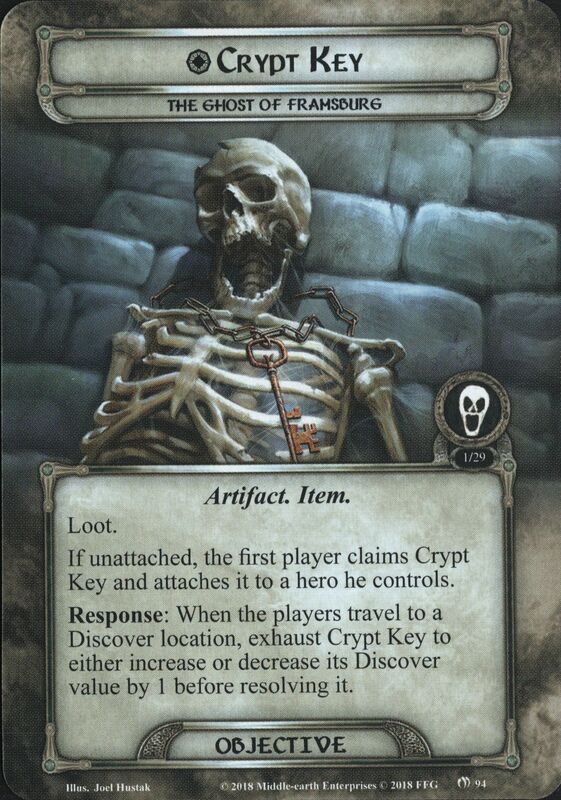 You can immediately play or put into play the revealed card for no cost, if able. Otherwise, move the revealed card to the bottom of your deck. Attach to a hero. Attached hero gains a Leadership resource icon. If attached hero is Aragorn, each character you control gets +1 Willpower. Limit 1 per deck. 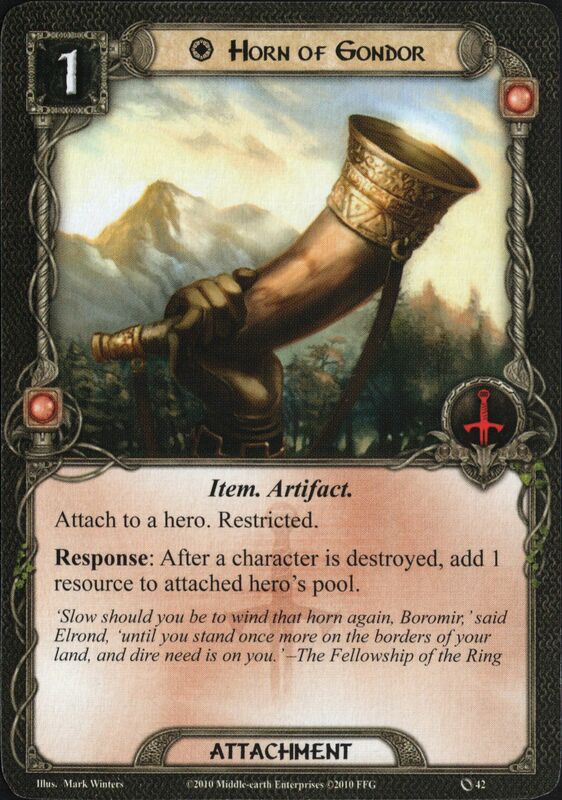 Attach to a Gondor hero. Attached hero gets +1 Willpower. 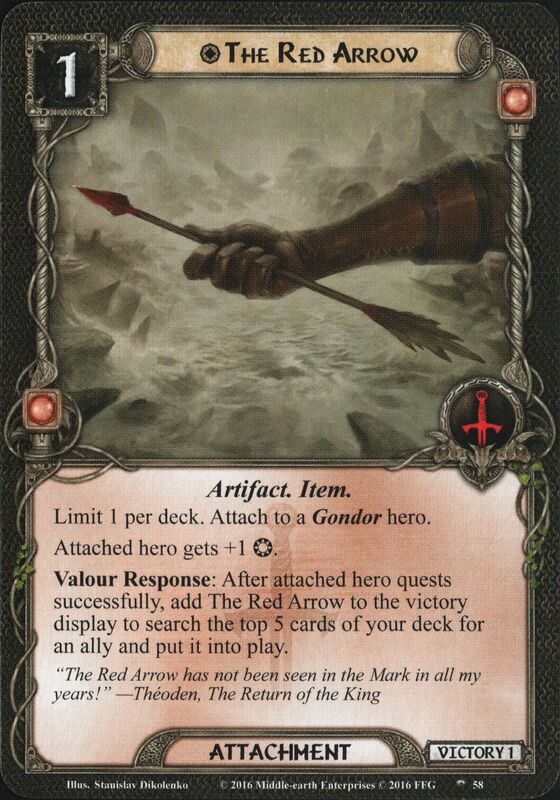 Valour Response: After attached hero quests successfully, add The Red Arrow to the victory display to search the top 5 cards of your deck for an ally and put it into play. Attach to Aragorn. While Aragorn is questing, each other questing character you control gets +1 Willpower. While Aragorn is attacking, each other attacking character you control gets +1 Attack. 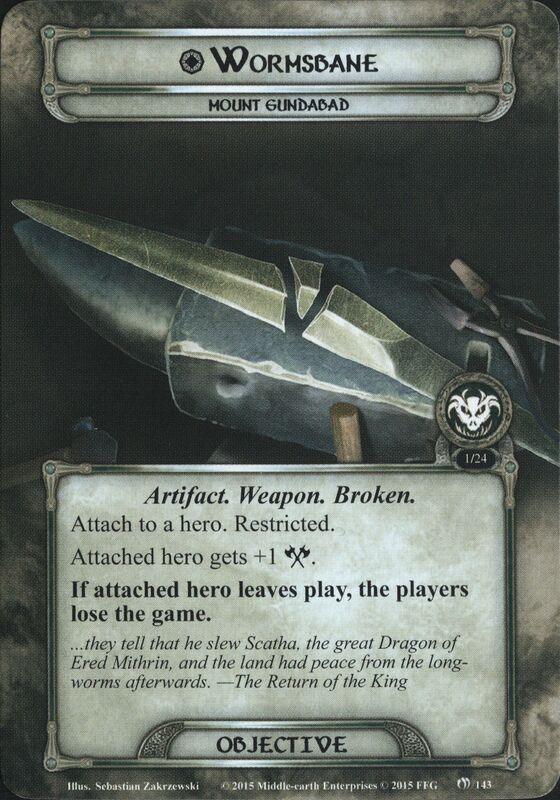 While Urdug's Horn is free ot encounters attack it to Urdug. Forced: When Urdug attacks, discard the top card of the encounter deck and add it's Threat to his Attack until the end of the phase. Attach to Radagast. Action: Exhaust Radagast's Staff to choose one: Reduce the cost of the next Creature ally you play this phase by 2, ready a Creature ally, or return a non-unique Creature enemy engaged with you to the staging area. Immune to non-Master card effects. 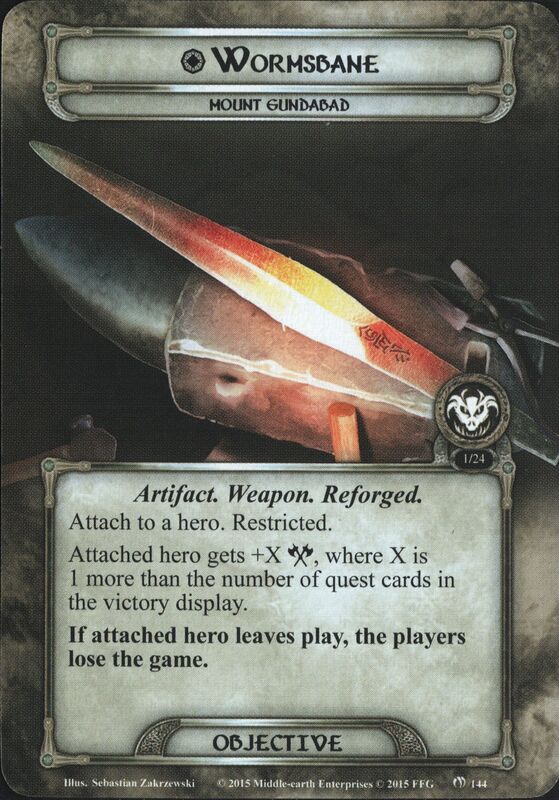 Setup: Attach to a hero you control and search your deck for a Master card. Add it to your hand and shuffle your deck. Your threat elimination level is reduced by 5. 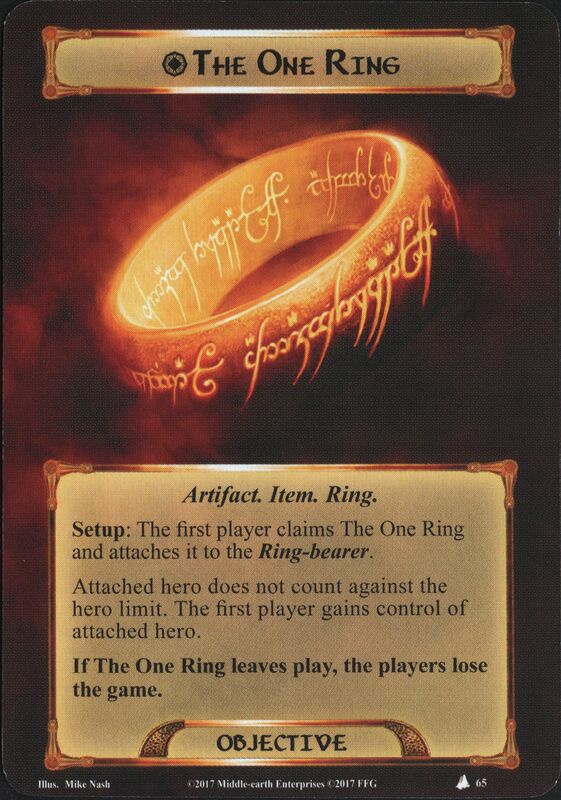 If The One Ring leaves play, the players lose the game. Attach to Bilbo Baggins. 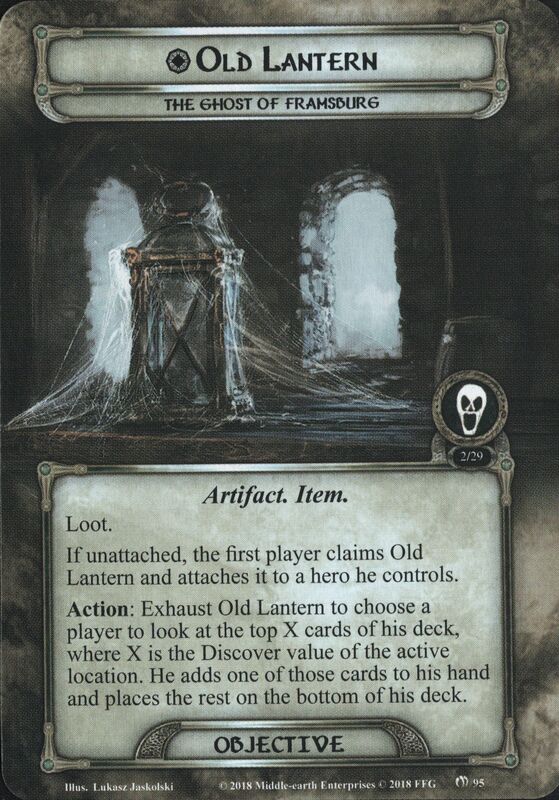 Action: When answering a riddle, spend 1 Baggins resource to discard an additional player card from the top of your deck. 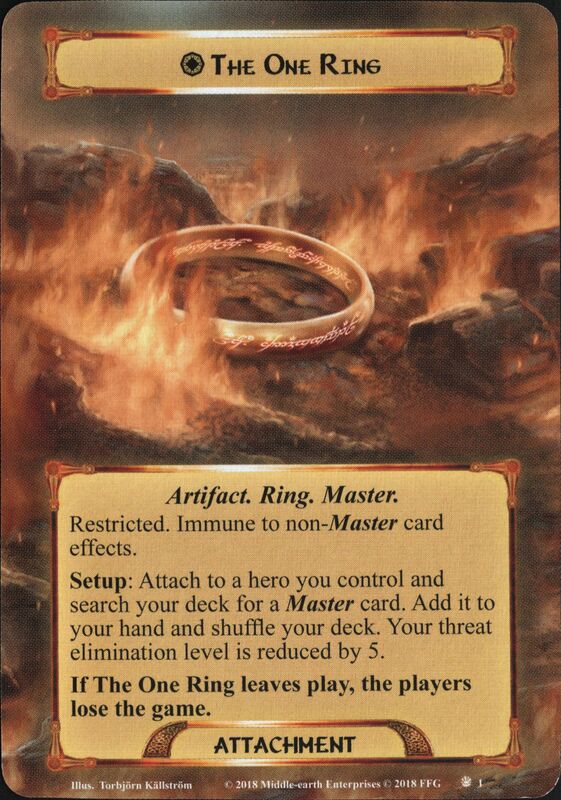 Action: Exhaust Bilbo's Magic Ring and raise each player's threat by 2 to add 1 Baggins resource to Bilbo Baggins' resource pool. Attach to Ring-bearer. Attached hero gets +1 Defense and +1 hit point. Attach to Fellowship Aragorn. 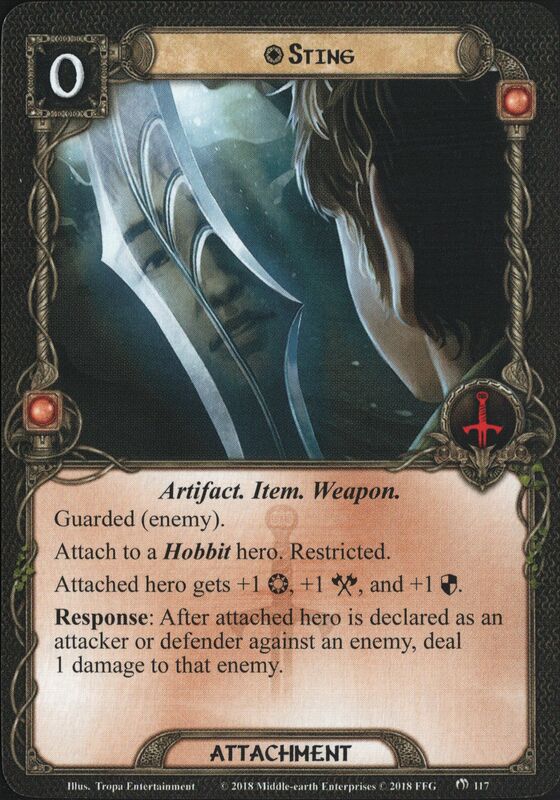 Quest Action: Exhaust Aragorn and Palantír of Orthanc to discard the top card of the encounter deck. 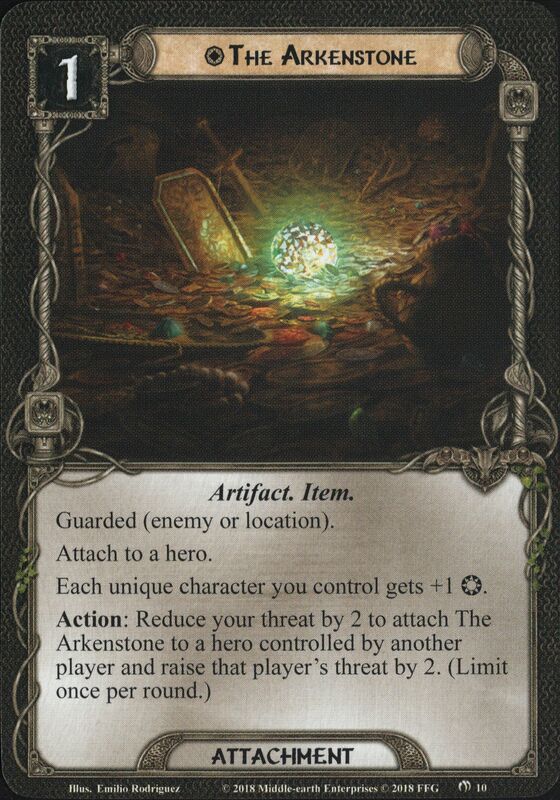 If Aragorn's Willpower is greater than the discarded card's Threat, you may add Palantír of Orthanc to the victory display and remove it from the campaign pool to choose a player. That player reveals 1 fewer encounter card this phase (to a minimum of 0). 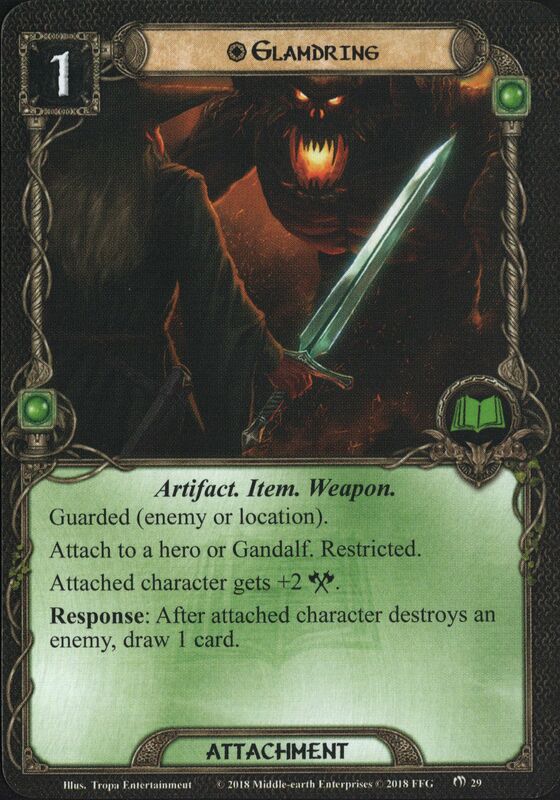 Forced: After a player draws any number of cards, Saruman attacks that player. Deal and resolve 2 shadow cards for this attack. Then, remove 1 damage from Saruman. 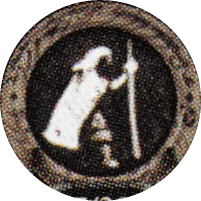 While Saruman has any hit points remaining, the players cannot win the game.